A recent Volac survey found about three out of four dairy farmers were extremely or very concerned about future volatility in bought-in feed costs and milk price. Moreover, 82% were looking to reduce bought-in feed costs. But despite 90% rating greater use of grass silage as either extremely or very important to help achieve this, the survey revealed some key shortfalls in silage-making techniques. 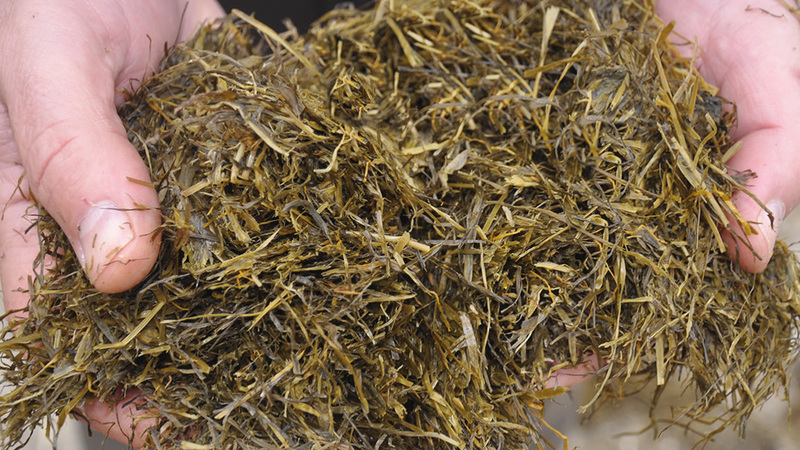 Volac silage microbiologist Philip Jones says: “This was something we had suspected, because, in general, silage quality does not seem to be improving. However, against a background of unpredictability in milk price and bought-in feed costs, particularly with Brexit, becoming more self-sufficient in what you feed cows makes sound business sense. In line with this, Mr Jones says Cut to Clamp divides silaging into six logical steps. “Silage is produced when beneficial bacteria ferment sugars in grass to lactic acid which ‘pickles’ it to preserve nutrients. “During the process, you are looking to maximise the nutritional value of the grass you cut, but also to manage it for the best possible fermentation. CUTTING grass at the correct stage is crucial, agree Mr Jones and Dr Davies. Although it is a challenge, with weather and contractor availability to wrestle with, it is essential to achieve the optimum balance of yield and quality, they point out. Dr Davies agrees farmers often delay cutting to boost silage yield. But while this might produce a heavier crop, he says because its nutritional value will be lower, it will not have the same capability to support the mproduction of milk. He says: “If you cut at 11.5 ME and you have 1,000 tonnes of silage, it is the equivalent of 300,000 MJ of energy extra compared to cutting at 10.5 ME. This is approximately equivalent to 60,000 litres of milk. “Yes, there will be a lower yield, but where you cut later, your losses are actually higher than in a lighter crop. So the yield difference is not as great as farmers think and the quality makes up for this difference. “Also, a lot of farmers think the lower the cutting height, the higher the yield. “But if you cut higher, you are leaving the base of the stem in the field which is the part with the lowest digestibility. So again you will improve overall quality by cutting higher.” Mr Jones says cutting too low risks introducing soil microorganisms, such as clostridia, into silage, increasing the risk of poor fermentation and reducing its feed value, or potentially contaminating with listeria. WILTING to increase the percentage of dry matter reduces effluent. It also means silage stabilises at a higher dry matter, so less acid, hence sugar, will be required, as well as inhibiting spoilage bacteria, such as clostrida, says Mr Jones. Wilting grass to 28- 32% DM is the target, he says. Dr Davies says: “The higher the sugar content the better. It is an indicator of good silage practice. “As soon as you have cut, sugars start declining because they are being used by the plant, because it is still living, and by undesirable bacteria. The aim should be to wilt as quickly as possible to 28-32% DM. “Too many people wilt for a fixed window, but in good conditions the standard 24 hours could be too long. “If you cut in the afternoon, sugar content might start off higher because the crop has been photosynthesising for longer that day, but you probably have to wilt for 24 hours. “Over a 24 to 36-hour period, you can lose 6% of sugar which is huge, whereas if you cut in the morning and achieve a rapid wilt, you could be harvesting by 5pm, so sugar content could turn out to be higher.” To achieve 28-32% DM quickly, Dr Davies recommends silage should be conditioned and spread. 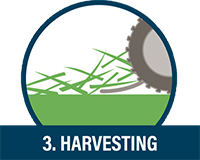 As a guide, Mr Jones says 1% of moisture is lost per hour of sunlight in bright conditions – greater if using mower-conditioning and tedding – however, tedders and rakes must be adjusted to avoid hitting the ground. WHEN harvesting, optimum chop length is key, both experts agree, as it has a big impact on consolidation. Mr Jones says: “Fermentation starts once the air in the clamp is used up, so the quicker you can achieve this the better. “A longer chop makes it more difficult to squeeze air out, particularly with drier crops. However, too short a chop can also cause problems. As well as keeping knives sharp, ensure they are correctly adjusted according to the crop’s percentage DM. “Above 30% DM, chop to 15-25mm to improve consolidation, although if grass silage is being fed as part of a high maize diet, this should be increased to ensure sufficient effective fibre in the diet. “At 20-30% DM, aim for 25-50mm; if less than 20% DM, you may need to increase up to 100mm to reduce effluent and prevent clamp slippage.” With chop length so critical for optimum clamp density, Dr Davies reckons farmers do not focus on chop length enough. Also avoid simple mistakes like over-filling trailers, says Dr Davies. One of the most cost-effective ways to feed cows. Reduced reliance on bought-in feed. 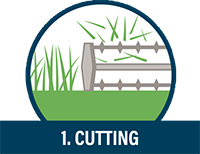 Improved returns from one of your farm’s main assets: your grass. Reassurance of feeding wholesome, home-produced feed. ‘Hidden’ benefits from a more forage-based diet – for example, improved cow health and fertility and lower vet bills.